Synopsis: This then is the first full dictionary of the earliest Mongol version of the thirteenth-century moral guide Sa skya Legs bshad that was compiled in Tibetan by the famous high priest and scholar Sa skya Pandita, and as such an indispensable tool for the study of Tibeto-Mongol translation techniques, and Mongol language history in general. The medieval Mongol translator Sonom Gara's words written in Uygur letters or printed in Kubilai's Square Script are listed here in transcription together with an English interpretation and their equivalents in the Tibetan original. Parallel passages are quoted from later seventeenth- and eighteenth-century Mongol translations. The foreword extensively discusses the strophic structure, notions and values, discrepancies between the Tibetan and the Middle Mongol versions, Uygur elements and other peculiarities of Sonom Gara's language. 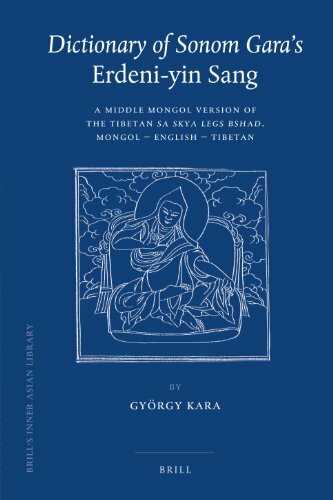 Review&colon; "Kara's edition also includes the entire vocabulary of several other texts of the fourteenth century, and it offers parallel readings from the seventeenth- and eighteenth-century Mongolian translations.Giving a historical perspective on Mongolian techniques of translation, it facilitates a more accurate reading of secular and Buddhist literary works abounding in Middle Mongolian lexicon and forms. Kara's learned introduction discusses the strophic structure, orthography, phonetics, lexicon, and grammar of Sonom Gara's language, and shows inconsistencies between the Tibetan and Middle Mongolian versions. This dictionary will greatly benefit both Mongolian language scholars and scholars of Buddhism seeking to make sense of Mongolian translations of Tibetan Buddhist texts." GYÖRGY KARA WITH THE ASSISTANCE OF MARTA KIRIPOLSKÁ.